The serial number can be located on the back of the TV on a small white sticker under the barcode. If you are unable to access behind the TV you can also find it on the box the TV arrived in. If this is also not possible some retailers may keep track of serial numbers at the point of purchase so you could always try the retailers customer service number. How do I register my TV? 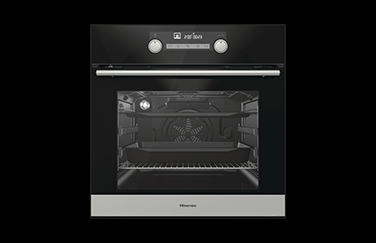 To register your product please visit Hisense Warranty. How to I protect my data if I sell or dispose of my TV? Perform a factory reset to clear your settings on your TV. This will remove and delete any stored data on your TV. To do this simply use your remote control and go to Settings–System–About TV–Restore to Factory Default. If my TV goes for repair will my data be protected? Our engineers are fully compliant with data protection laws. If you are concerned, simply perform a factory reset on your television before it is taken away for repair. To do this simply use your remote control and go to Settings–System–About TV–Restore to Factory Default. Press the home button on your remote controller and go into Apps or ‘View my Apps’. Within the App Store, you can then search and browse the latest apps for your TV. Why are my channels in a random order after I updated my software? The new software may have cleared your old TV data. To reorder them, try re-scanning your channels via the menu settings. What is the code for my sky/virgin remote control for my TV? This depends on the remote controller, specific to each TV model. Please call the service centre on 0333 800 2200, who will be happy to provide you with the correct code. To check the version of software/firmware currently on your TV simply use the remote control and follow these instructions. To check if there is any software/firmware update currently available for your TV simply use the remote control and follow these instructions. Your TV will now check for any new software update if available. If there is it will update with new software otherwise it will state ‘Your firmware is up to date’. Is the EPG supposed to be laggy / unresponsive? After the TV has been turned on, the first time the EPG is used it may lag slightly. This is because it takes some time to load the programme information. How long does my TV Warranty last? 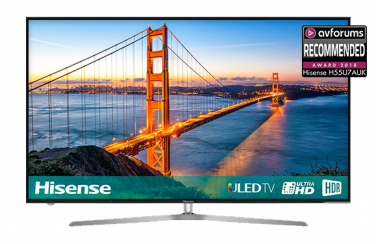 All of our Hisense TV’s come with a 2 year warranty as standard, which includes over the air software updates. How can I learn more about the End User License Agreement on my TV? The End User License Agreement (“EULA”) governs and regulates the use of the Device and the Smart Services, and is a legal agreement between the end user (referred to as “you” or “your”) and Hisense , its affiliates, subsidiaries and/or parents (referred to as “Hisense” or “we” or “us” or “our” or “ours”). Please read this EULA carefully. By using the Device, installing and/or using and/or accessing or using the Smart Services through this Device, or any other features of functionality made available on your Device, you agree to be legally bound and abide by this EULA. Your use of the Device and/or the Smart Services indicates that you have read and accepted this EULA and any other applicable terms. By using the Device and/or the Smart Services, you acknowledge and accept the Data Protection Policy (available at your Device first setup process or go to “Home” screen, select “Settings”, select “Support”/“About TV”) which governs the collection and use of your Personal Data. If you do not wish to agree to this EULA or the Data Protection Policy, you must not access or use the Smart Services in connection with the Device. Please note that we will only collect Personal Data in relation to a specific Smart Service if you choose to interact with that Smart Service. For example, as set out below, your Personal Data will not be collected via the Amazon Alexa Service unless you choose to enable that service. “Application(s)” means an embeddable, downloadable and/or executable software application owned by us or a third party and made available on the Device. “Device” means this Hisense Smart TV. “Intellectual Property Rights” means all legal and beneficial title and/or interest in all patents, utility models, rights to inventions, copyright and related rights, moral rights, trademarks, trade names, rights to domain names, rights in get-up and trade dress, rights in goodwill or to sue for passing off, unfair competition rights, rights in designs, rights in computer software, database rights, rights in confidential information (including know-how and trade secrets) and any other intellectual property rights, in each case whether registered or unregistered and including all applications, rights to apply for and obtain, and renewals or extensions of, rights to claim priority from such rights and all similar or equivalent rights or forms of protection which subsist or will subsist, now or in the future, in any part of the world. “Materials” collectively means any Content, Submitted Content (where applicable and as further defined herein), messaging, blogging, chatting, social networking, information, advertising and/or internet links, etc., accessible or delivered through the Device. “Smart Service(s)” means the access, procurement, disposal, sale, purchase, subscription, lease, rental or consultation or other use of Materials, and all other types of services or functions typically available from the Internet, offered by us or by third parties through Applications. All Applications and Materials are owned and/or licensed by and from Hisense or by and from third parties, as applicable, and may be protected by any Intellectual Property Rights and/or applicable laws. From time to time, we may directly offer and make available to you certain Smart Services. Your use of such Smart Services shall be subject to this EULA. Smart Services may be provided locally subject to local laws and regulations and, depending on your residence, location and network availability, the types and levels of the Smart Services available may be limited. The EULA for the use of such Smart Services may differ for each different country, region or market, and are subject to relevant local, country and regional laws and regulations. All Smart Services are provided solely for your personal use in connection with your use of the Device. You may not use any Smart Services in a manner that has not been expressly authorized herein. Without limiting the foregoing, except as expressly permitted by this EULA and/or applicable laws and regulations, you may not modify, copy, re-publish, upload, post, transmit, translate, sell, create derivative works of, exploit, or distribute in any manner or medium any of the Smart Services accessed through this Device. Smart Services are intended for use by persons sixteen (16) years of age or older. If you are not at least sixteen (16) years of age or older or are legally, or otherwise, restricted from using the Smart Services, please discontinue using the Smart Services immediately. If you are not sixteen (16) years of age or older, you must have a parent or guardian’s approval prior to using the Smart Services. By using any portion of the Smart Services, you accept this EULA and are certifying that you are at least sixteen (16) years of age, are not under sixteen (16) years of age, or if you are under the age of sixteen (16), have parental or guardian’s consent. Any use of any Smart Services by any individuals not of such age shall be considered a violation of this EULA. The use of any portion of the Smart Services is restricted solely to personal use and no other uses are permitted. WE RESERVE THE RIGHT TO BLOCK OR TERMINATE ANY USER ACCOUNT IN THE EVENT WE REASONABLY DETERMINE THAT ANY USE OF ANY SMART SERVICES IS IN VIOLATION OF THIS EULA, INCLUDING CREATING ACCOUNTS WITH FALSE INFORMATION. Smart Services offered through the Device that require a fee may not be accessed by persons who have not paid the appropriate fee. In the event that registration, creation of a user account, and/or a fee is required for the Smart Services offered or provided by the provider or licensor of such Smart Services, such registration, creation of a user account, and/or a fee shall be subject to privacy policies, terms and conditions of such Smart Services provider or licensor. All Smart Services accessible through this Device may be changed, suspended, removed, terminated or interrupted, or access may be denied, blocked or disabled at any time, without notice, and we make no representations or warranties that any Smart Services will remain available for any period of time. All Materials are transmitted by means of networks and transmission facilities over which we have no control. We may impose limits on the use, disabling, removal or suspension of any Smart Services made available through this Device at any time, without notice or liability. We may impose limits on the use of, or access to, certain Smart Services in any case and without notice or liability. You must accept this EULA and the Data Protection Policy if you wish to use the Smart Services accessible through your Device. All third party Smart Services provided via the Device are managed and controlled by their respective owners. We are not responsible for the included, pre-loaded, user downloaded or other third party Smart Services, which may be modified, removed, deleted or changed, with or without notice by their respective owners. Any questions or requests for service relating to such Smart Services should be made directly to the respective third party Smart Services providers, and not to us. Access to certain portions of the Smart Services through our Applications may require registration and creation of a user account and/or a fee. Such registration, creation of a user account and payment of a fee may need to be completed on a webpage run by us (or an affiliate of ours) or by a third party (including a payment gateway provider). Such registration may require providing Personal Data to us or third parties (e.g., choosing a unique, secret password that may not be shared with others). Any Personal Data provided by you to us will be Processed in accordance with our Data Protection Policy (available at your Device first setup process or go to “Home” screen, select “Settings”, select “Support”/“About TV”). The Personal Data you provide for registration must be complete and accurate. You shall not use any third-party Personal Data to create an account in connection with the use of the Smart Services, and you are not allowed to access others’ accounts. We are not responsible for use or misappropriation of any other’s Personal Data to access the Smart Services. As between you and Hisense, Hisense owns all right, title, and interest in and to the Hisense owned Application, and each respective third-party Application owner owns all right, title and interest in and to their respective third-party Application, including, without limitation, all applicable Intellectual Property Rights or other proprietary rights in the Application throughout the world, regardless of whether registered or legally secured. Subject to the respective license agreements between us and the respective third-party Application owner, and your full compliance with this EULA, we grant to you a non-exclusive, limited, non-transferable and personal license (without the ability to sublicense) to download and/or use the Applications (other than any third-party Application which is governed by its own and separate license terms and conditions) to display, receive or otherwise use (only to the extent permitted in each case) the Smart Services through the Application from your Device only. No other rights to the Application are granted. The scope of rights for Smart Services shall be subject to the terms and conditions of the respective Smart Services and other licensing requirements and restrictions otherwise imposed or required by the relevant Smart Services providers. All rights including all Intellectual Property Rights in the Applications and the Smart Services remain our property or that of the relevant licensors or owners of the Application or the Smart Services. Any breach of this EULA will result in the revocation of the rights granted herein in whole or in part, and we or the respective owners of the Application and the Smart Services may take further legal action if necessary. You or any third party (directed by you) may not display, copy, store, modify, sell, trade, resell, reproduce, publish, broadcast, redistribute, or make derivative works of any Materials, whether a portion of or in their entirety, and such displaying, copying, storing, modification, sale, publishing, broadcasting or redistribution shall be prohibited unless you have obtained all necessary rights and permissions from us or each of the respective relevant owners or right holders of such Materials or as permitted by applicable law. Unauthorized use of the Materials is prohibited and may result in criminal prosecution and/or civil liability, for which you shall be solely responsible. You may not use any portion of the Device for any other purposes other than as permitted herein, including but not limited to illegal activity, to make solicited and/or unsolicited offers or advertisements, to impersonate or falsely claim affiliation with any person or entity, to misrepresent, harass, defraud or defame others, to post, upload, transmit or disseminate any obscene, unreasonably offensive or any other unlawful material, or any information that may negatively impact our reputation, goodwill and/or the Smart Services, nor for any commercial purposes. Except as expressly permitted by this EULA, and except to the extent provided for by applicable laws, you may not disassemble, reverse engineer and/or tamper with the Application(s), or transmit hidden or malicious code or to collect information of other users through the Application(s). You are not permitted to copy, edit, modify, alter or create a derivative work of, reverse engineer, decompile or otherwise attempt to extract the source code of any Application, unless expressly permitted by us in writing, or to the extent permitted under the laws applicable to you, and you will not permit or grant a license to any third party to do so. You may not take any action to interrupt the functionality of or tamper with the Materials contained in or provided through the Smart Services or its servers or to unreasonably affect others’ enjoyment of the Smart Services in any way. You may not in any manner attempt to gain unauthorized access to 1) any portion or feature of the Device; 2) the Smart Services, or any other systems or networks connected to the Device; 3) the Smart Services or to any Hisense controlled server; or 4) to any of the Applications, Materials, or other services offered on or through the Smart Services. WE RESERVE THE RIGHT TO BLOCK, DENY OR TERMINATE YOUR ACCESS TO THE SMART SERVICES IN OUR SOLE DISCRETION FOR ANY REASON AND AT ANY TIME AND WITHOUT NOTICE OR LIABILITY. Any Content submitted, uploaded or posted by you, on behalf of you, or by other users, on or through your Device or the Smart Services (herein “Submitted Content”) will be considered non-confidential and non-proprietary, subject to local laws and regulations. We also reserve the right to disclose your Personal Data as necessary to any third party who claims that any Submitted Content constitutes an infringement of third party Intellectual Property Rights, or of their right to privacy. By posting, submitting, uploading or otherwise transmitting Submitted Content in any way, you grant us a perpetual, irrevocable, unrestricted, non-exclusive, worldwide, fully paid-up, royalty free, sub-licensable license to use, modify, change, copy, disclose, license, perform, display, post, publish, distribute, transmit or otherwise use such Submitted Content in any manner, create derivative works thereof or incorporate the Submitted Consent into other work anywhere in the world. We have the right to remove any Submitted Content from the smart systems, and any other Hisense systems, for any reason including if, in our sole opinion, such Submitted Content is unnecessary, offensive, indecent or objectionable. We do not control the Submitted Content and do not warrant the nature, accuracy, integrity, appropriateness or quality of the Submitted Content. You warrant that any of your Submitted Content does not and will not infringe any third party Intellectual Property Rights. You are solely responsible for all Submitted Content that you upload, post, email, transmit, or otherwise make available in any portion of the Smart Services. We assume no liability for such Submitted Content and you are solely responsible for any liability arising from or related to any Submitted Content posted, uploaded or transmitted by you or on behalf of you on or through your Device or the Smart Services. We reserve the right to remove Submitted Content that may be infringing on another person’s Intellectual Property Rights with or without notice to the infringer and in accordance with applicable laws. You understand and agree that the Smart Services may include advertisements, certain communications from us or third parties such as update announcements, administrative messages, newsletters and other materials (“Communications”). As those Communications are part of the Smart Services, you may not opt out of receiving them. Certain Materials may not be suitable for minors or other users. Such Materials may not be rated or identified as being unsuitable. Therefore, you understand and agree that you are using the Materials at your own risk and we shall have no liability to you for any unsuitable Materials. To learn about how Hisense protects and handles your Personal Data and other information when you use the Smart Services, visit our Data Protection Policy (available at your Device first setup process or go to “Home” screen, select “Settings”, select “Support”). FOR THE DEVICE, HISENSE GRANTS TO YOU A SPECIAL WARRANTY TO THE EXTENT AS SPECIFIED AND UNDER THE PREREQUISITES SET IN THE DEVICE WARRANTY CARD. IN CASE OF A DEFECT OF THE DEVICE, YOU ARE NOT ENTITLED TO ANY FURTHER CLAIMS, IRRESPECTIVE OF THEIR LEGAL BASIS, AGAINST US. THE FOREGOING LIMITATIONS SHALL NOT APPLY IN CASES OF WILLFUL MISCONDUCT, GROSS NEGLIGENCE OR PERSONAL INJURY. FOR THE AVOIDANCE OF DOUBT, THE AFORESAID DOES NOT LIMIT HISENSE’S LIABILITY FOR DAMAGES ACCORDING TO MANDATORY STATUTORY PROVISIONS. FURTHERMORE, THE SPECIAL WARRANTY GRANTED BY HISENSE DOES NOT EXCLUDE OR LIMIT ANY CONTRACTUAL OR STATUTORY CLAIMS YOU MAY HAVE AGAINST THE SELLER OF THE DEVICE. TO THE EXTENT PERMITTED BY LAW, WE EXPRESSLY DISCLAIM ALL WARRANTIES, CONDITIONS, TERMS, REPRESENTATIONS AND UNDERTAKINGS WITH RESPECT TO ANY THIRD PARTY SMART SERVICES, EITHER EXPRESS OR IMPLIED, AND ALL ASSOCIATED RISKS FROM THE USE OF THE DEVICE, INCLUDING BUT NOT LIMITED TO WARRANTIES OF MERCHANTABILITY, OF SATISFACTORY QUALITY, FITNESS FOR A PARTICULAR PURPOSE, OF ACCURACY, OF QUIET ENJOYMENT, AND NON-INFRINGEMENT OF THIRD PARTY RIGHTS. THE FOREGOING LIMITATIONS SHALL NOT APPLY IN CASES OF WILLFUL MISCONDUCT, GROSS NEGLIGENCE, PERSONAL INJURY OR FRAUDULENT CONCEALMENT OF A LEGAL OR MATERIAL DEFECT OF THE RESPECTIVE SMART SERVICES BY US. WE DO NOT GUARANTEE THE ACCURACY, VALIDITY, TIMELINESS, LEGALITY, OR COMPLETENESS OF ANY THIRD PARTY SMART SERVICES MADE AVAILABLE THROUGH THE DEVICE AND DO NOT WARRANT THAT THE SMART SERVICES WILL MEET YOUR REQUIREMENTS, OR THAT THE DEVICE IS OR WILL BE COMPATIBLE WITH ALL SMART SERVICES, OR THAT OPERATION OF THE DEVICE OR SMART SERVICES WILL BE UNINTERRUPTED OR ERROR-FREE. YOU AGREE TO ASSUME ALL RISKS OF USING THE SMART SERVICES, AND, TO THE EXTENT PERMITTED BY LAW, NOT TO HOLD US OR ANY OF OUR HOLDINGS, DIRECTORS, OFFICERS, EMPLOYEES, PARTNERS, CONTRACTORS, LICENSORS OR ADVERTISERS RESPONSIBLE FOR ANY DAMAGES, LOSSES, OR HARM, TANGIBLE OR INTANGIBLE, INCLUDING BUT NOT LIMITED TO COMPENSATORY, CONSEQUENTIAL, PUNITIVE, INCIDENTAL, LOSS OF PROFIT, REVENUE, INTEREST OR BUSINESS, OR CORRUPTION OF DATA OR ATTORNEY’S FEES ARISING FROM THE USE OF THE SMART SERVICES AND/OR MATERIALS. DUE TO THE VARIOUS CAPABILITIES OF DEVICES FEATURING THE SMART SERVICES, AS WELL AS LIMITATIONS IN THE AVAILABLE SMART SERVICES OFFERED VIA THE DEVICE OR APPLICATION(S), CERTAIN FEATURES AND/OR SMART SERVICES MAY NOT BE AVAILABLE ON ALL DEVICES OR IN ALL TERRITORIES OR MAY CHANGE OVER TIME. SOME FEATURES ON THE SMART SERVICES MAY ALSO REQUIRE ADDITIONAL PERIPHERAL DEVICES THAT ARE SOLD SEPARATELY. WE DO NOT ENDORSE ANY OF THE IDEAS, PRODUCTS, PERSONS, OR OPINIONS EXPRESSED IN THE SMART SERVICES AND/OR MATERIALS. WE SHALL NOT BE LIABLE TO YOU, WHETHER IN CONTRACT OR TORT OR OTHERWISE, FOR ANY DIRECT, INDIRECT, INCIDENTAL, SPECIAL OR CONSEQUENTIAL LOSS OR DAMAGES, LOSS OF PROFIT, REVENUE, INTEREST, BUSINESS OR CORRUPTION OF DATA, ATTORNEY FEES, EXPENSES, OR ANY OTHER LOSS OR DAMAGES, INCLUDING PUNITIVE DAMAGES ARISING OUT OF, OR IN CONNECTION WITH, ANY SMART SERVICES CONTAINED IN, OR AS A RESULT OF THE USE, OF THE DEVICE, OR ANY SMART SERVICES ACCESSED OR USED BY YOU, EVEN IF ADVISED OF THE POSSIBILITY OF SUCH LOSS OR DAMAGES. CERTAIN LEGISLATION MAY IMPLY WARRANTIES OR CONDITIONS OR IMPOSE OBLIGATIONS UPON US WHICH CANNOT BE EXCLUDED, RESTRICTED OR MODIFIED OR CANNOT BE EXCLUDED, RESTRICTED OR MODIFIED EXCEPT TO A LIMITED EXTENT. THIS EULA MUST BE READ SUBJECT TO THESE STATUTORY PROVISIONS. IF THESE STATUTORY PROVISIONS APPLY, TO THE EXTENT TO WHICH WE ARE ABLE TO DO SO, OUR LIABILITY UNDER THOSE PROVISIONS WILL BE LIMITED, AT OUR OPTION, IN THE CASE OF SERVICES TO (A) THE SUPPLYING OF THE SERVICES AGAIN; OR (B) THE PAYMENT OF THE COST OF HAVING THE SERVICES SUPPLIED AGAIN AND, IN THE CASE OF GOODS, TO (A) THE REPLACEMENT OF THE GOODS OR THE SUPPLY OF EQUIVALENT GOODS; (B) THE REPAIR OF THE GOODS; (C) THE PAYMENT OF THE COST OF REPLACING THE GOODS OR OF ACQUIRING EQUIVALENT GOODS; OR (D) THE PAYMENT OF THE COST OF HAVING THE GOODS REPAIRED. THE FOREGOING LIMITATIONS SHALL NOT APPLY IN CASES OF WILLFUL MISCONDUCT, GROSS NEGLIGENCE, PERSONAL INJURY OR FRAUDULENT CONCEALMENT OF A LEGAL OR MATERIAL DEFECT OF THE RESPECTIVE SMART SERVICES BY US. YOU ASSUME FULL RESPONSIBILITY FOR ANY DAMAGES, LOSSES, COSTS, OR HARM ARISING FROM YOUR USE OF THE SMART SERVICES. TO THE EXTENT PERMITTED BY LAW, WE DISCLAIM ALL LIABILITIES WITH RESPECT TO YOUR USE OF THE SMART SERVICES (REGARDLESS OF WHETHER OR NOT SUCH USE REQUIRES REGISTRATION, CREATION OF A USER ACCOUNT AND/OR PAYMENT OF A FEE) AND MATERIALS. THE FOREGOING LIMITATIONS SHALL NOT APPLY IN CASES OF WILLFUL MISCONDUCT, GROSS NEGLIGENCE, PERSONAL INJURY OR FRAUDULENT CONCEALMENT OF A LEGAL OR MATERIAL DEFECT OF THE RESPECTIVE SMART SERVICES BY US. IF ANY PORTION OF THIS EULA ARE ILLEGAL OR UNENFORCEABLE OR THERE IS A CLAIM THAT WE HAVE BREACHED ANY OF THIS EULA, IT DOES NOT AFFECT OR INVALIDATE THE OTHER TERMS. THIS EULA MAY NOT BE WAIVED OR MODIFIED WITHOUT WRITTEN CONSENT FROM US. FOR THIRD-PARTY SMART SERVICES, TO THE FULLEST EXTENT PERMITTED BY LAW, WE SHALL NOT BE HELD RESPONSIBLE FOR ANY THIRD-PARTY SMART SERVICES THAT MAY BE ACCESSED THROUGH THE DEVICE OR APPLICATION(S), NOR SHALL WE BE HELD RESPONSIBLE FOR HIDDEN OR MALICIOUS CODE CONTAINED ON OR DISTRIBUTED THROUGH THE APPLICATIONS OR OUR DEVICE BY THIRD PARTIES. WE DO NOT GUARANTEE THAT THERE WILL BE NO INTERRUPTIONS, DELAYS OR INACCURACIES IN THE SMART SERVICES AND DO NOT GUARANTEE THE CONTINUED AVAILABILITY OF SUCH SMART SERVICES. TO THE FULLEST EXTENT NOT PROHIBITED BY APPLICABLE LAW, IF YOU CLAIM THAT YOU HAVE INCURRED ANY LOSS, DAMAGES, OR INJURIES IN CONNECTION WITH YOUR USE OF THE DEVICE, THEN THE LOSSES, DAMAGES, AND INJURIES WILL NOT BE DEEMED IRREPARABLE OR SUFFICIENT TO ENTITLE YOU TO AN INJUNCTION OR TO OTHER EQUITABLE RELIEF OF ANY KIND. THIS MEANS THAT, IN CONNECTION WITH YOUR CLAIM, YOU AGREE THAT YOU WILL NOT SEEK, AND THAT YOU WILL NOT BE PERMITTED TO OBTAIN, ANY COURT OR OTHER ACTION THAT MAY INTERFERE WITH OR PREVENT THE DEVELOPMENT OR EXPLOITATION OF ANY DEVICE, APPLICATION, CONTENT, SUBMITTED CONTENT, PRODUCT, SERVICE, OR INTELLECTUAL PROPERTY RIGHTS OWNED, LICENSED, USED OR CONTROLLED BY US (INCLUDING YOUR SUBMITTED CONTENT) OR OUR LICENSORS. You agree to defend, indemnify and hold harmless Hisense, its affiliates, licensors and service providers, and its and their respective officers, directors, employees, contractors, agents, licensors, suppliers, successors and assigns from and against any claims, liabilities, damages, judgments, awards, losses, costs, expenses or fees (including reasonable attorneys’ fees) arising out of or relating to your violation of this EULA or your use of the Device and/or Smart Services, including, but not limited to, your Submitted Content, and any use of the Materials, services and products other than as expressly authorized in this EULA or your use of any information obtained through the Device. To the extent permitted by law, this EULA shall be governed by the laws of the Germany and by accepting this EULA, and by your use of the Smart Services, you are agreeing that such EULA and all other aspects of the Smart Services will be construed in all respects in accordance with the laws of the Germany, and you agree to submit to the non-exclusive jurisdiction of the courts of Dusseldorf, Germany. We may need to comply with the lawful interception and/or data retention requirements of local law enforcement agencies from time to time. We may restrict access to any part of the Smart Services and the Device or terminate your access to the Smart Services, at any time in our sole discretion if required by law or by the relevant authorities or regulatory agencies to do so. You are not permitted to transfer, assign or otherwise dispose of this EULA which is personal to you, or any of your rights or obligations arising under this EULA without the prior written consent of Hisense. No waiver of by Hisense of any term or condition set forth in this EULA shall be deemed a further or continuing waiver of such term or condition or a waiver of any other term or condition, and any failure of Hisense to assert a right or provision under this EULA shall not constitute a waiver of such right or provision. If any provision of this EULA is held by a court or other tribunal of competent jurisdiction to be invalid, illegal or unenforceable for any reason, such provision shall be eliminated or limited to the minimum extent such that the remaining provisions of the EULA will continue in full force and effect. This EULA constitute the sole and entire agreement between you and Hisense with respect to your use of the Device and/or the Smart Services and supersede all prior and contemporaneous understandings, agreements, representations and warranties, both written and oral, with respect to your use of the Device and/or the Smart Services. We may revise and update this EULA from time to time in our sole discretion. All changes will be posted at your Device or through update with reasonable period before they become effective. They deemed to be accepted by you unless you have notified us of your refusal within the above-mentioned period. In case of refusal you can terminate the EULA with immediate effect. In all other cases the updated EULA applies to all access to and use of the Device and the Smart Services thereafter. We may provide you with notices (including notices relating to changes to this EULA or termination of the Smart Services or parts thereof) by email, ordinary mail, or postings on or via the Device or Smart Services. Please direct any additional questions you may have regarding This EULA to the local after-sales service center written in the warranty card inside the box of each Device or email to gjyxinfo@hisense.com. Where can I find my serial number on my fridge? How do I register my fridge? Why does my fridge not come on at all? There are a few simple checks you can do: see if the light comes on when you open the fridge door and make sure the power is connected correctly. Change the plug to another socket and be sure other electrical devices work when connected to the same power point. Why is my fridge not cooling at all? To lower the fridge temperature, simply adjust the thermostat. Listen to see if you can hear the sound of the compressor running, or the sound of the compressor starting and stopping continuously. Why is my fridge not cooling enough? Adjust the temperature to a lower setting, check the door is sealed properly when closed and make sure there are no warm food items placed in the fridge. Why is there water leaking inside my fridge? If a lot of high moisture content food i.e. salads have recently been added then this will condense as part of the refrigeration cycle. Alternatively, the drain pipe could possibly be blocked at the back, inside the fridge. If a blockage is present, the drain pipe can be cleared by inserting a thin knitting needle or braising rod down the drain pipe hole. How do I stop my water dispenser from leaking? If you have re-installed the water tank after cleaning, check if the nozzle is correctly connected to the door liner. The water container in the fridge compartment must be fitted vertically with two hoses. If the water dispenser leak persists, please call our Service Line on 0191 387 0804. Why is my freezer over freezing / getting a build up of ice? Check the temperature setting, ensuring it’s not too low. Make sure the doors are properly sealed when closed. A small amount of ice may form but this will disappear on the defrost cycle. Why is my fridge vibrating / making a noise? The internal fan and compressor will generate noise. This is completely normal. Check if the fridge is level, adjust the feet if not. Be sure there is enough clearance between the wall / skirting board and the fridge. The product’s noise level is indicated on the energy label provided. 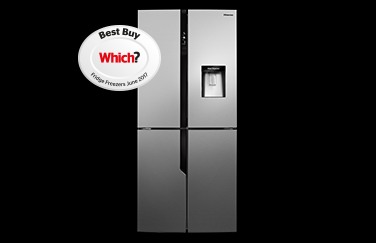 Is there anyone I could telephone to help me with my fridge or freezer query? Yes, of course, if you’re still experiencing problems with your product, one of our after-sales support team at JTM would be more than happy to help. How long do I need to wait before I can switch it on after delivery? 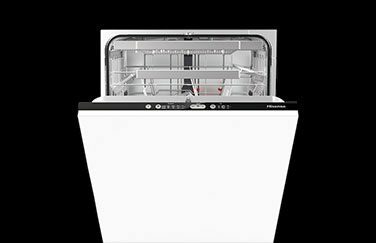 If the appliance has been stood upright during transit you can switch it on immediately. Ask your driver if it has been loaded on its side, if this is this case, we would suggest waiting 12 hours. Do I need to defrost my appliance? Although our appliances automatically defrost, a layer of frost may occur on the freezer compartment’s interior walls if the freezer door is opened frequently or kept open too long. If the appliance is not frost-free then a regular defrost is recommended to ensure the appliance is running at optimum efficiency. How hot is the side of the appliance supposed to get; do I have a fault / is it dangerous? At times the units can reach up to 40℃ or more, this depends on the running rate of the compressor. An overheat thermostat is fitted for safety in the event of compressor overheating. Avoid leaving the refrigeration door open for long periods of time, making sure there is enough ventilation space between the wall and product. For further information, please refer to the user manual. If the side of the unit reaches extremely high temperatures such as 80℃, please call our service line for help on 0191 387 0804. Where can I find my serial/model number on may washing machine? How do I register my washing machine? Check all cables are correctly connected and switched on, including the power plug and water inlet tab. If the issue persists, call our Service Line on 0191 387 0804 for assistance. How do I clean the filter in my washing machine? We recommend that you check and clean the filter regularly, at least two or three times a year. For information on washing machine care and maintenance, please follow the product user manual provided. These can be downloaded via each product page on our website. How long are the different programs for my washing machine? 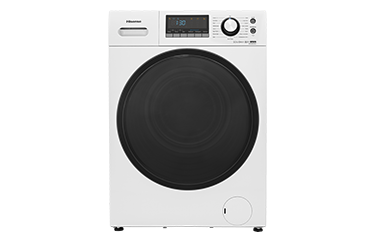 Our washing machines have a series of features and functions to provide optimum results every time. For your convenience, all of our models include a 15-minute quick wash. Please follow the product user manual for further information.